Click Here To See Spectacular Spider-Man #114 Comic Book! 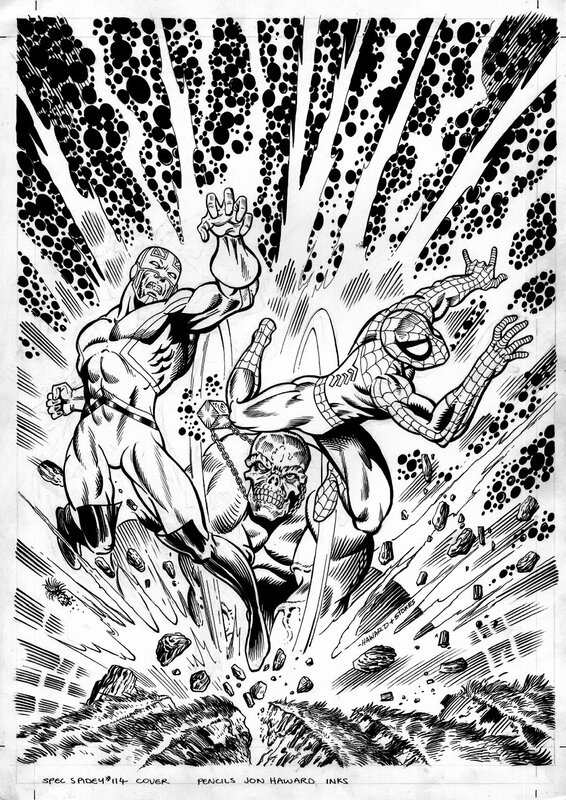 Check out this very nice cover, which was penciled by Jon Haward, and inked by John Stokes, from the story titled: "Blast to the Past" In Manhattan, the Red Skull uses the Cosmic Cube to have reality go wild. As a result, for example, cars come alive and chase New Yorkers. Captain Britain flies in from London to find the Cosmic Cube and runs into Spider-Man. A typical misunderstanding has them fight briefly and they land in a museum, where they are confronted by the Red Skull. A fight reveals that it is merely a robot impostor. The real Skull faces them and explains he lured Captain Britain there, because he wants to add the mystic circuitry in his costume to the Cosmic Cube’s power. Cap refuses and the Skull takes them back in time to Darkmoor, minutes before young Brian Braddock will meet Merlyn and be turned to Captain Britain. In this time, the mystic circuitry turns back into its original shape, that of the Amulet of Right. Cap refuses to hand it over. He and Spider-Man begin to fight a super-strong Skull! 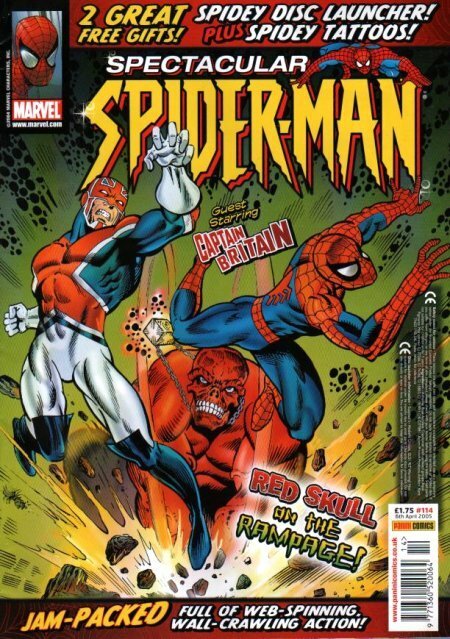 There was some hype surrounding this story, as it is the first original British story starring Captain Britain in over 15 years! Just a great cover! Compare this nice cover art to the published comic book in the red link above! ALL art on our website (including this one) are able to be purchased with VERY fair time payments, and trades are always considered towards "ANY" art on our website! Just send us an email to mikeburkey@aol.com and we can try to work something out.